Millions of Americans believe there exists a larger, darker explanation for President Kennedy's assassination than just Oswald, the lone, disturbed gunman. As covered in FRONTLINE's investigative biography of Oswald, here are some of the major questions raised by conspiracy theorists over the years and how science and technology have helped answer most of them. The Magic Bullet: Critics say it was impossible for just one bullet to pass through both Kennedy and Connolly unless it pursued a bizarre zig-zag trajectory. Furthermore, the bullet emerged in good condition. A single bullet could inflict all seven wounds on both the President and the Governor and emerge in very good condition. That's because, as it slowed, moving through the two men, it moved fast enough to break bone, but not fast enough to deform the bullet. Tests were conducted by both the Warren Commission and the House Select Committee that supported this conclusion. Oliver Stone's three-hour movie was released in late 1991 and ignited a public furor. For a majority of Americans it rekindled their suspicion that Oswald was part of a larger conspiracy. Combining fact and fiction, real and fake footage, the movie's storyline suggested that John Kennedy was killed in a coup d'etat by forces within the U.S. government. What obligation does Hollywood owe facts, accuracy, and the truth? When popular history like JFK gets hold of a subject, what kind of damage can be done? Those are the central questions in this 1992 panel discussion with authors Norman Mailer and Edward J. Epstein, screenwriter Nora Ephron, and producer/director Oliver Stone. The three-hour forum was held at Town Hall, New York City, on the night of March 3, 1992, and was sponsored by The Nation Institute and the Center for American Culture Studies at Columbia University. It's clear from the start that it's largely a pro-Stone audience as speakers Ephron, Epstein, and Mailer lay out their views on the movie and its critics. Oliver Stone follows, talking about his work on the movie and how it has made him question the history he was taught in school and through the media. The panelists are followed by guest questioners Christopher Hitchens, Bill Schapp, and Max Holland. Their responses, along with the audience's questions, produce heated moments and stormy applause throughout the rest of the evening. Polls conducted periodically since the assassination show most Americans continue to believe the president's murder was part of a larger plot. Here are events over the decades which have been a factor in keeping conspiracy thinking alive. New Orleans: During the summer of 1963 -- just months before the assassination -- Oswald reportedly was in contact with men who had connections to the Mafia. In New Orleans, Oswald entered the most mysterious and perplexing chapter of his short life, and the murky trail he left behind in that city still defies a complete explanation. In "Who Was Lee Harvey Oswald?," FRONTLINE spends some time examining this puzzling period in his life. If there was a plot to kill President Kennedy, then it was probably hatched in New Orleans. It was here that Lee Oswald may have crossed paths with men that hated Kennedy and wanted him eliminated. º Read the section of the program transcript dealing with this period. The Grassy Knoll: Was There a Fourth Shot? The exact number and timing of the shots have been argued over endlessly, but there is a growing consensus that the Zapruder film shows three shots were fired in about eight seconds. Many believe a second gunman fired a fourth shot from the grassy knoll. Immediately after the shooting, many people followed a policeman up the embankment. But when police searched the area, they found no gunman, no gun, no cartridges. Years later it was discovered that a motorcycle policeman's radio button had been jammed open and that the gunshots in Dealey Plaza may have been accidentally recorded. Says Gerald Posner, author of Case Closed: "The House Select Committee on Assassinations [1978-79] used sound experts to listen to a Dallas Police dictabelt and they concluded with a 95 percent certainty that there was a fourth shot fired at Dealey Plaza and it came from the grassy knoll. A few years later, a National Academy of Sciences (NAS) panel reviewed their work and found a multitude of errors and omissions, the most serious of which was that the time that the Select Committee experts thought the shots were being fired was the wrong time. It was actually one minute after the assassination had actually taken place." But the acoustics controversy didn't end there. In 2001, Dr. Donald B. Thomas, a researcher for the U.S. Department of Agriculture, had a paper published in the British journal Science and Justice which challenged the 1982 NAS report and was widely circulated in the assassination research community. Members of the original NAS panel are currently preparing a rebuttal to the Thomas analysis. º Read more about the acoustics debate. Mexico City: Was there an intelligence cover-up? As FRONTLINE reported in its program, for 40 years the CIA has covered up its record on the Oswald case. 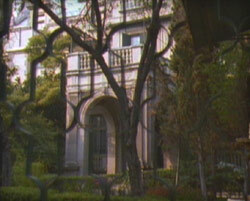 However, intelligence documents released in the mid to late 1990s have helped shed light on one significant episode in this cover-up -- Oswald's trip to Mexico City in early September-late October, 1963 and his visits to the Cuban consulate and Soviet embassy to obtain travel visas. º Read historian John Newman's article for FRONTLINE, "Oswald, the CIA, and Mexico City," about what the documents now reveal. The JFK Autopsy: Critics say it was corrupted because it didn't show there was a fourth bullet or that the fatal shot entered the president's head from the front, not the back. 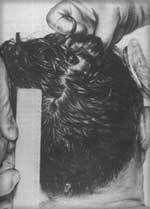 Drawing depicting the posterior head wound (from HSCA records, Vol 17). 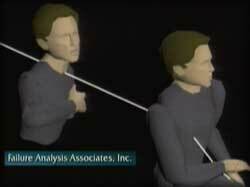 In the chaos and confusion of that day, many mistakes were made in the autopsy on Kennedy's body. But the medical photos and X-rays confirm that there were only two shots that struck the president and both came from the rear. Four separate government investigations have so concluded. The last one, the House Select Committee on Assassinations in 1978-79, had the largest forensics panel reexamining all the evidence. As for the president's backwards head movement, the second and fatal shot -- as seen in the enhanced Zapruder film -- makes it appear that the shot came from the front. But experts explain that two things are happening in that split second. As the fatal bullet destroys the president's brain, he goes into a neuromuscular seizure and his body starts to stiffen up. At the same time that the bullet wound explodes out the right front side of his head, and as that blood and brain tissue moves out, it forces him in the opposite direction, the jet effect, back and to the left, violently. The Sixth Floor of the Book Depository: Some witnesses thought they saw two men. At 12:23 p.m. that day, amateur cameraman Charles Bronson panned across the Book Depository. FRONTLINE had this footage scientifically enhanced to determine whether a second person could be seen on the sixth floor. When processed to reduce the grain noise in the frame, all of the images throughout the frame look approximately the same and show no evidence of anybody walking around. There was also film shot by Robert Hughes, showing the motorcade approaching Dealey Plaza. Hughes stops filming for a few seconds and then starts again just as the limousine passes in front of the depository. Says image processing analyst Francis Corbett: "On the Hughes film, there are a lot of things to see and on the fifth floor in particular, we see an employee of the Book Depository raise his right arm as he waves to the motorcade passing just under the building. Now we move to the sixth floor and we observe in the arched window that is adjacent to the sniper's nest a form that some people have said is human-like in appearance. And when we ran the enhanced film in motion, that human form disappears and we conclude there is no human form in that window. We do also conclude that there is movement in the sixth floor corner window, indicating the presence of a person." 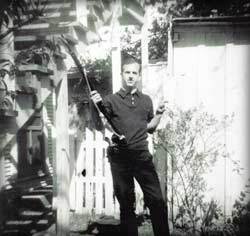 A few days after receiving a .38 pistol and a cheap Italian rifle he had ordered by mail, Oswald asked his wife, Marina, to take a picture of him in the backyard of their Dallas apartment dressed all in black and posing with the two guns. The Mannlicher-Carcano rifle in his hand is the same one used to kill President Kennedy. Marina Oswald testified before the Warren Commisision that she took the photographs. She identified the camera she used and the FBI was able to tie that camera, to the exclusion of all other cameras, to these photographs. Years later, the House Select Committee on Assassinations (1978-79) worked with a photographic panel and studied all of the testimony and whether there were incongruous shadows in the photographs, as critics alleged. Oswald had given a copy of the photograph to his friend George de Mohrenschildt and Oswald had signed it. The House Committee's experts concluded beyond a doubt that the signature was Oswald's. Any notion that the photo was faked by other people to frame Lee Harvey Oswald would have to explain the fact that Oswald himself signed it. G. Robert Blakey was chief counsel on the House Select Committee, which had the FBI conduct tests on the camera and film. Says Blakey: "There are microscopic, unique indentations. Based on them, if you have the negative and the camera, you can -- just like you can match the grooves in a bullet to the grooves created by the barrel ballistics -- you can match a camera and a negative or a photograph. That's precisely the technique that the FBI employed. The details of it are set out for all to read in the Warren Commission hearings and report. We undertook a similar analysis on the committee and the photographic panels' report is set out in our hearings as well. This is science. This is not memory, this is not perception, this is something that anybody with the expertise can replicate for themselves."